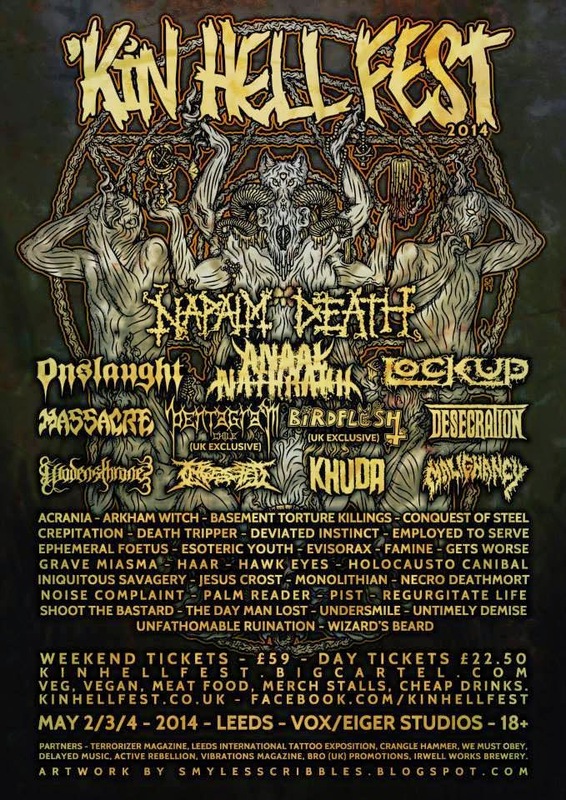 I'm not one for writing live reviews usually, but I wanted to write something about my weekend at 'Kin Hell Fest 2014. Where do I start! How about by saying it was awesome. Paul and the rest of the crew did a great job all weekend with it. Just like last year, it was well organised and ran pretty smoothly, in spite of the last minute band cancellations. The line-up was a great mix of local acts and bands from further afield, covering the multitude of sub-genres and including some big name headline acts and international bands, like Napalm Death and Massacre. It was a staunchly DIY festival and as a result was so relaxed and friendly, which is all you can ask for really. My standout bands during the weekend were Ephemeral Foetus, Pentagram (Chile), Jesus Crost, Employed To Serve and especially the intimate set by Khuda. That was something else! My main reason for writing this post was that Paul and festival overall has not made enough money to cover costs. It's not for me to say that people should have made more of an effort to attend etc, but I just wanted to raise a bit of awareness I guess. I think one of the reasons for the deficit was the fees demanded by bigger bands on the bill. I realise that bands need to make a living and cover costs of travelling in order to play but when such bands denounce "big corporations" and don't exist in the mainstream, should they really be asking for £x thousands for the privilege of playing shows to their fans, whom without they would not have a career? Rant over. All in all, it was a great weekend. I met some people I'd only ever spoken to via Facebook and met some of the bands too. People travelled from far and wide to watch the bands for the whole weekend and it was great chatting and partying with like minded people. I partied to hard on Sunday and it turns out that headbanging for three-four hours straight is bad for your body. Who knew? Anyway, if you want to donate or pick of merchandise to help 'Kin Hell Fest, so that it might carry on next year, head over to their website here - http://www.kinhellfest.co.uk.